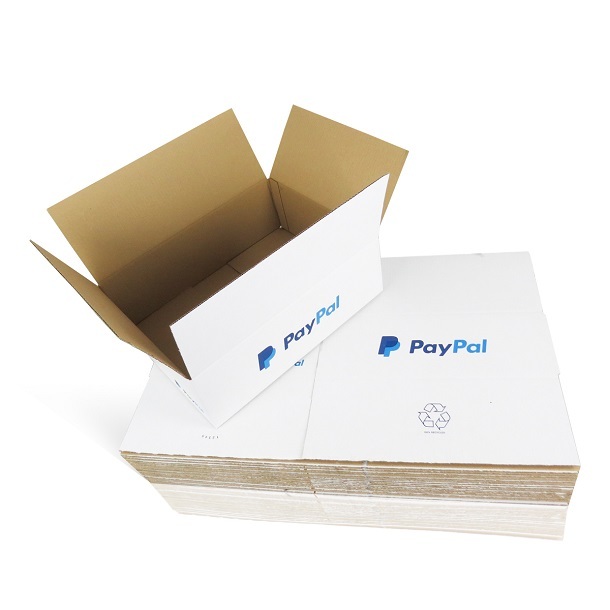 200 x PayPal branded high quality white single wall postal mailing cardboard boxes, specifically manufactured to meet the maximum external size allowed by Royal Mail under their new and latest 'small parcel' guidelines, enforced on 20 October 2014. Perfect for fitting anything that can be sent as a small parcel, providing an all round box for all these items, ensuring that you keep postage costs down. Easy standard construction 0201 style boxes in white outer with two colour branding, enhancing confidence to your customers and giving your items an excellent presentational feel. These boxes are an environmentally friendly product. They are made from 100% recycled material and are 100% recyclable. Click Here to view the full royal mail 'small parcel' regulations enforced since 2014, and the corresponding box sizes that we stock which meet this criteria.